Habitat: sunny, sheltered habitat, The soil should be moist, rich in humus and well drained. Once flowers have formed, to help with pollination occasionally give the plants a shake towards midday. Thin out the side shoots, only leaving 3 shoots, each with 2 - 3 fruit. Your need: One person consumes an average of 300 g a year. Aubergines originated from tropical East India so they need a corresponding amount of warmth. The plants grow to a height of about 130 cm and produce purple coloured flowers from which fruit will develop over the course of the summer. They require a warm, sunny, protected location as would be suitable for wine growing. The soil should be moist, rich in humus & nutrients and well drained. Aubergines are propagated via their small white seeds. The take a comparatively long time to develop, so they should be sown very early. Germination time: two to four weeks at a temperature of 22 to 24°C. 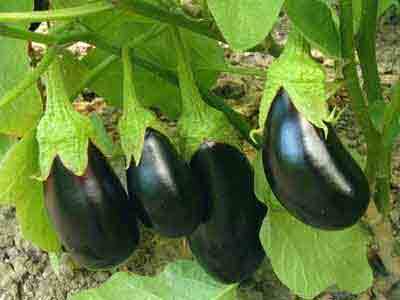 Aubergine plants can be either self or cross fertilized by the wind or by insects. Water regularly but not excessively. Do not pour water on the leaves. Fertilise with horse manure, compost or nettle swill. The ideal temperatures for aubergines to grow healthily are between 25 and 30°C, and they should never fall below 20°C. Thin out the side shoots and remove the lower leaf shoots. Only keep 3 shoots, each with 2 to 3 fruit. Cover the soil with compost and then cover that with a black plastic mulch sheet which will increase the soil temperature by 4°. Pests: Whiteflies, spider mites as well as cotton aphids (greenfly). This starts at the edge of the leaf and then progresses to the leaf's central vein. The leaves turn light green and later on they go a yellowy colour. Aubergines only ripen on the plant so, in autumn before the frost starts, repot the plant and allow it to ripen indoors. They are ready to harvest when they show a high gloss and the seeds are soft and white. Do not allow to overripen, as they can quickly rot, become tough or wrinkly. Cut off the aubergine where the stem is joined to it. Aubergines will keep for up to one week if stored in a cool place at a temperature between 10 and 13°C. Aubergines contain a toxin called solanine, which can cause gastrointestinal problems. This is why they must be completely cooked or fried. One person consumes an average of 300 g a year. The yield depends on the variety, the location and the weather and can fluctuate greatly between years. Marketable yields in the open field are up to approximately 1.7 kg per plant. The per head consumption of eggplants in Germany is around 300 grams per year.